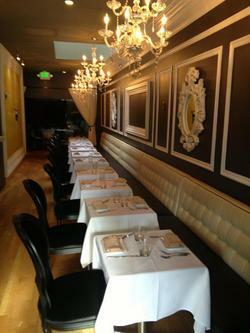 The new look at Gusto; photo via Facebook. Last week, owner Enzo Rosano of ~LOCANDA POSITANO~ and ~LIMONE~ in San Carlos sent out a teaser email about his plans to bring on chef George Morrone for a project. It ends up Rosano has turned Limone into ~GUSTO~, and starting Tuesday November 5th, will be serving “sophisticated small plates” like Morrone’s famed tuna tartare, lobster corn dogs, and other dishes ranging from $4-$8 for snacks and $8-$18 for small plates. (Morrone will continue to consult at the Corinthian Yacht Club in Tiburon.) The space is getting quite an update, with chandeliers and a black-and-white theme that includes black velvet-backed wooden chairs and a tufted white upholstered banquette (ooh, molto chic). 619 Laurel St. San Carlos, 650-486-1479.